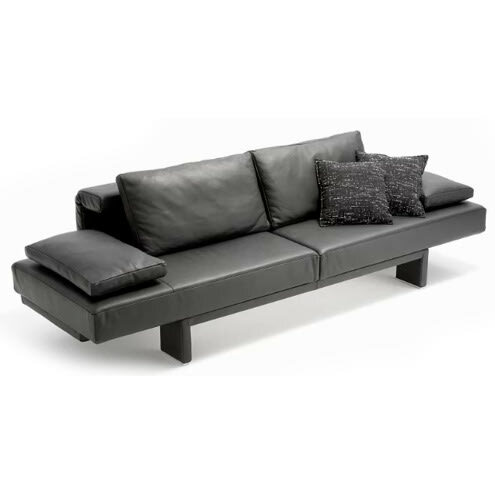 Modern multifunctional sofa with swivel seats for relaxation function. Can be converted to sofa bed. Multifunctional sofa. seats swivel for relax function and as bed. Scene - elegance with a magical changeability. scene surprises with many details. The back rests can be individually adjusted - even the depth of the seat can be changed. Both seating surfaces can be swiveled and form either a relaxing lounger or a full single or double bed with the back rests folded down. The armrests can serve as a shelf or night stand. In ca. 200 different fabric, microfiber and leather covers available. New! Available also without armrests. Do you have a question about "Scene with armrests"? How can we contact you?